Another of our popular properties at The Falls, Old Mill Cottage was once part of the former bobbin mill which took its power from the water falls and produced wood-turned spindles and shuttles in the last century. Old Mill Cottage & Squirrel Bank offers weekly bookings starting on Friday and Saturday. Another of our popular properties at The Falls, Old Mill Cottage apartment was once part of the former bobbin mill which took its power from the waterfalls and produced wood-turned spindles and shuttles in the last century. The cottage is stone-built and there are good views from the sitting room balcony to Loughrigg Fell. 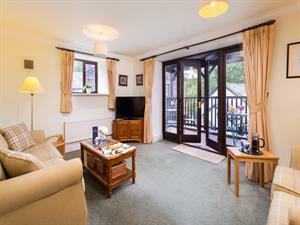 Good walks and rambles abound in the area for all ages and abilities, and you can easily stroll into Ambleside village for day to day shopping and eating out. Accommodation: Built on two floors the property has a ground floor front door leading into the hallway where you can hang your walking gear. Large fitted contemporary dining kitchen - ideal for family meals. One good twin-bedded room on this level with built-in cupboards. Ground floor wc with hand basin. Stairs to the first floor where there is a comfortable sitting room (TV with basic Sky package, DVD, video, radio) with French windows leading onto a wide balcony which has a garden table and chairs and views down the valley - you will enjoy eating out here in warmer weather. Two further bedrooms - one double and one single. Fully fitted bathroom has bath with shower over, basin and wc. Fitted carpets throughout. The property has a light and pleasant feel. Outside: Undercover parking for one car with space for one additional smaller car behind it. Walks from the door to surrounding fells. Sitting room balcony with garden table and chairs. One well behaved pet accepted * non-smokers please * Wifi not available * duvets/beds made up for arrival * electric cooker and hob * auto washing machine/dryer * fridge * freezer * dishwasher * microwave * gas central heating * all fuel included * travel cot and high chair available - please order * towels available - please order * private parking - two cars * shops etc. half mile approx. One wellbehaved pet. Parking space for 1 or 2 small cars. Old Mill Cottag offers weekly bookings starting on Saturday.